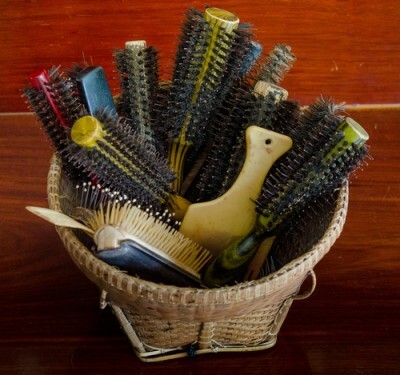 Over time your hair brush can become clogged with hair, oil, skin from your scalp and build up of hair styling products. Sometimes it can even harbour bacteria and dandruff, so its great to give your hairbrush a good clean to keep it in tip top condition. Remove hair from your hair brush. Boil 2 cups of water & pour into a large bowl. Add 2 Cups of DYC White vinegar to the bowl. Soak the head of the brush (not the handle) in the mixture for long enough to loosen dirt but not to melt your brush. Remove from the mixture and use a comb of your fingers to remove stray hairs and debris. If your hairbrush has wide spaced bristles you can clean the base with an old toothbrush. Rinse under cool water and dry off with a towel. Allow to dry before using.